If you are anything like me, you have fought with a USB port on more than one occasion when your flash drive or other device just didn’t want to plug in. I end up flipping it over several times in an attempt to plug the thing in and end up wondering why the port won’t just work from either side. 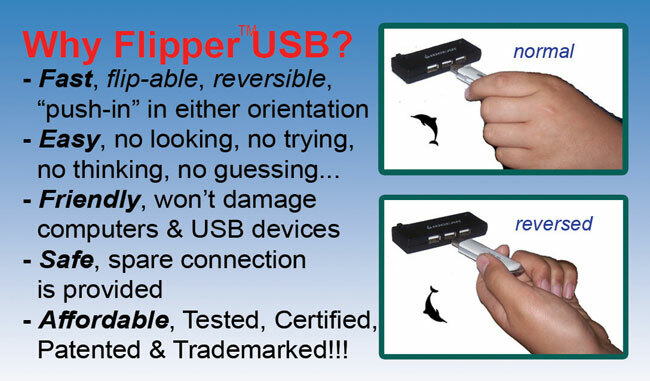 A new USB port has surfaced called Flipper USB. The Flipper name comes from the fact that you can plug the USB device into the port in either direction. That means no more messing with trying to get things plugged in. At least it means no more flipping your flash drive over repeatedly thinking you have it turned the wrong way. The downside is that it appears the maker of a computer or mainboard has to use the Flipper USB port in manufacturing, you can’t add them to an existing machine. A USB hub with these plugs has to be on its way.